So it turns out that my little guy is allergic to eggs. I have yet to test how allergic or to see if perhaps yolk will pass the test, so in the meantime I'm experimenting with healthy mini muffins to keep him entertained at the dinner table. These were a huge hit. At 6.5 months, he had never eaten any baked goods: bread, muffin, you name it. This was the first attempt and it was great. So moist and easy for him to hold onto, none actually went to waste. It was a little terrifying to watch since it looked like it was trying to shove the entire thing in his mouth, but he figured it out and ate the entire thing. 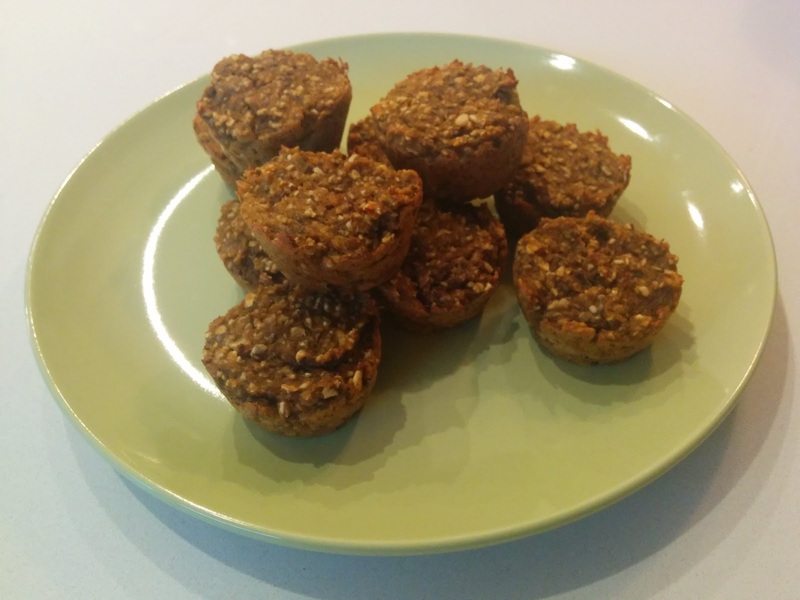 Delicious bite-sized allergy-friendly muffins for your baby to bite into! These are dairy free, egg free, nut free and gluten free so long as you use gluten free rolled oats or oat flour. In a large bowl, mix chia seeds and water. Refrigerate for 15 minutes to set. Mash banana. Mix banana and sweet potato puree into chia seeds. Pour batter into greased mini-muffin tins. You can fill them almost to the top as they don’t raise very much. Bake at 400 degrees for 12-14 minutes, until toothpick comes out clean. If you don't have mini muffin tins, you can fill large muffin tins up to about 1/2 inch.